I love a lot of things and among them are tea and free stuff. So I was interested when I saw this free Essential Tea Collection trial from ALOHA. I have started using tea in a lot of different ways. Many few years ago I got into flavored teas but when I was in Hawaii last year I discovered Valerian root tea for relaxation. Now I swear by it! I also keep on-hand peppermint tea for stomach aches, caffeinated tea for early show choir or speech team mornings, and more. I have a whole shelf in my pantry just for tea! Sleep Tea: Lemon balm and chamomile to relax, valerian root to calm the nervous system and lemon balm to ease overall tension. Caffeine free. Energy Tea: Oolong and schizandra berries awaken and revitalize while antioxidant-rich yerba mate provides stamina and helps with focus. 14mg caffeine/serving. Smart Tea: Gingko Biloba helps improve memory and focus, while panax ginseng boosts cognitive performance. Looking at those ingredients, I can see how each would help with what it says–especially the Sleep Tea. 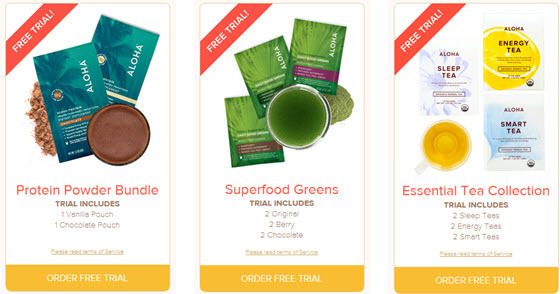 ALOHA offers 2 other free trials as well that you might be interested in: Protein Powder Bundle and Superfood Greens. What’s the catch? You do pay $2.99 for shipping and you will be automatically enrolled in the program if you do not cancel during your 7 day trial. They are a very reputable company and just want to get their products in your hands to prove to you how good they are. I’ve not read any reports at all of people having a hard time cancelling or feeling like they were tricked in any way. In fact, most people end up wanting the subscriptions! I’m going to give ALOHA a shot and see what I think. Although I have quite a stash of Valerian root tea right now from Christmas, I love trying new kinds. And I am intrigued at the idea of the Energy and Smart Teas! Are you a tea drinker? Do you think it can change your mood?